Rizol for alfalfa is a microbial inoculant for alfalfa seed inoculation. 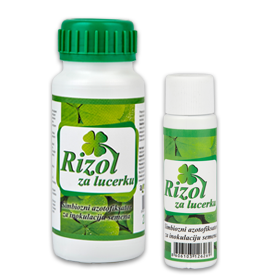 Rizol for alfalfa contains effective strains of rhizobia Rhizobium (Sinorhizobium) meliloti, associative nitrogen fixers and growth stimulators inflicted on specific carriers in the liquid state. Symbiotic fixing bacteria through root hairs get inside of the root, where they start to divide rapidly what will for result have nodules in which the bacteria will fix nitrogen. NITROGEN FIXATION is process of converting atmospheric nitrogen (N2) in the form of NH4 which is biologically active and can be used by all organisms in the Earth. Nitrogen forms about 78% of Earth's atmosphere and is useful for all living world thanks to nitrogen fixing bacteria, microorganisms who are able to use atmospheric nitrogen and to convert it into ammonia. SYMBIOTIC NITROGEN FIXING BACTERIA makeing nodules at the roots of leguminose plants (soy bean, peas, bean, alfalfa, clover etc.) where process of nitrogen fixation is takeing place. These bacteria are strictly specific for certain plant species, one bacterial species creates nodules at appropriate plant. Bacteria and plant make symbiosis , type of community in which bacteria are supplying plant with nitrogen while plant supplays bacteria with nutritive materia made during photosynthesis. 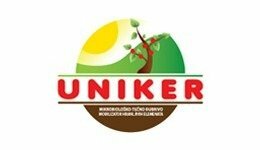 Applying biofertilizers with appropriate symbiotic nitrogen fixing bacteria,i.e. inoculating seed of leguminous plants increase forming nodules at the root. Simbiotic nitrogen fixing bacteria enter into parenchym of the root starting to multilply rapidly which will cause forming the nodule where fixation of the nitrogen will take place. Except symbiotic these products contain and associative nitrogen fixing and phosphate solubilizing bacteria, who will after applying biofertilizer inhabit root surface. The seeds of alfalfa mixed with the contents of the bottle, leave it to dry in air and sow. The content of the bottle of 200 ml is sufficient for a seed standard hectare. 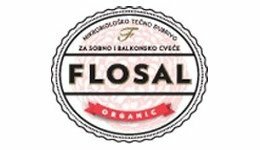 If necessary, can be added to water or SLAVOL S. seed treatment can be performed several days before sowing. It is recommended to spray Slavol at the stage when the plant is first formed two pairs trolistaka.